This is a famous English surname of considerable history and antiquity. Usually recorded as Hardinge, Harding or even Arding, it has its origins in the pre 7th Century personal name 'Hearding', meaning 'The son of the hard one'. To be so called was well thought of in those far off days, when most 'names' were associated with war, glory and god, and the nameholders have certainly lived upto it. Other pre 10th century compound names include 'Hardwulf', although this does not seem to have come down as a modern day surname, or 'Hardstaff' which has, although this latter maybe a medieval nickname of less salubrious meaning. St. Stephen who died in 1134, was called 'Harding', although purely as a given name. He became the abbot of Citeaux in France in 1110, and founded the religious order known as the Cistercians. 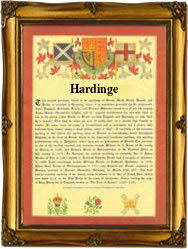 Amongst the first colonists of the State of Virginia, New England, was Christopher Harding. He has the the doubtful honour of being one of the first colonists to die being recorded as 'kild' at a place called 'At west and Sherlow hundred' sometime before February 16th 1623. The surname is enobled through the Viscounts and the Baronets Hardinges of Boundes Park, Kent. Their main coat of arms has the blazon of a red field, on a chevron in silver, three escallops in gold, the sign of the Crusader. The 'arms' also have an augmentation of a surrended French frigate, possibly a reference to a victory by Sir Henry Hardinge The first recorded spelling of the family name is shown to be that of Roger Harding. This was dated 1199, in the "Pipe Rolls of Northamptonshire", during the reign of King Richard 1st of England and known to history as "The Lionheart", 1189 - 1199. Throughout the centuries, surnames in every country have continued to "develop" often leading to astonishing variants of the original spelling.